James Rufus Agee (November 27, 1909 – May 16, 1955) was a Pulitzer Prize-winning American novelist, screenwriter, journalist, poet, and film critic. In the 1940s he was one of the most influential film critics in the U.S. His autobiographical novel, A Death in the Family (1957), won the author a posthumous Pulitzer Prize. His deep Episcopal roots instilled a keen understanding of the desire and shortcomings of the human condition. Long after his death, his novels and screenplays, including the African Queen, endure as famous works of literature. Many of his works were autobiographical and reveal his own passion and struggles, as well as his alcoholism. His Let Us Now Praise Famous Men takes readers to the heart of human suffering, and to the human spirit that wills one to live despite suffering. Agee was born in Knoxville, Tennessee, at Highland Avenue and 15th Street (renamed James Agee Street in 1999), to Hugh James Agee and Laura Whitman Tyler, and had distant French and English ancestry on his father's side. When Agee was six, his father died in an automobile accident, and from the age of seven he and his younger sister, Emma, were educated in boarding schools. He felt lost and abandoned. His father was gone and he desperately missed the daily contact with his mother. His mother believed sending the children to Christian schools would provide the religious training and education she felt was important. The most influential of these was located near his mother's summer cottage two miles from Sewanee, Tennessee. Saint Andrews School for Mountain Boys was run by Episcopal monks affiliated with the Order of the Holy Cross, and it was there that Agee's lifelong friendship with an Episcopal priest, Father James Harold Flye, began in 1919. As Agee's close friend and spiritual confidant, Flye was the recipient of many of Agee's most revealing letters. After the marriage of his mother to Father Erskind Wright, treasurer at St. Andrew's, Agee went to Knoxville High School for the 1924-1925 school year. That summer, Father Flye took Agee to Europe. On their return, Agee moved to boarding school in New Hampshire, entering the class of 1928 at Phillips Exeter Academy, to be closer to his mother who now resided in Maine. There he was president of The Lantern Club and editor of the Monthly, where his first short stories, plays, poetry, and articles were published. Despite barely passing many of his high school courses, Agee was admitted to Harvard University's class of 1932. He was editor-in-chief of the Harvard Advocate and delivered the class ode at his commencement. After graduation, he wrote for Fortune and Time magazines. (He is better known, however, for his later film criticism in The Nation.) He married Via Saunders on January 28, 1933; they divorced in 1938, and that same year he married Alma Mailman. In 1934, he published his only volume of poetry, Permit Me Voyage, with a foreword by Archibald MacLeish. In the summer of 1936, Agee spent eight weeks on assignment for Fortune with photographer Walker Evans living among sharecroppers in Alabama. 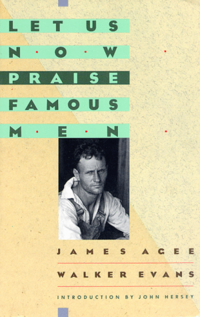 While Fortune didn't publish his article (he left the magazine in 1939), Agee turned the material into a book entitled, Let Us Now Praise Famous Men (1941). It sold only 600 copies before being remaindered. That same year, Alma moved to Mexico with their one year-old son, Joel, to live with Communist writer Bodo Uhse. Agee began living with Mia Fritsch in Greenwich Village, whom he married in 1946. They had two daughters, Teresa and Andrea, and a son, John, who was eight months old when Agee died. In 1942, Agee became the film critic for Time, while also writing occasional book reviews, and subsequently becoming the film critic for The Nation. In 1948, however, he quit both magazines to become a freelance writer. As a freelancer in the 1950s, he continued to write magazine articles while working on movie scripts (often with photographer Helen Levitt). In 1951, in Santa Barbara, Agee suffered the first two in a series of heart attacks, which ultimately claimed his life, four years later at the age of 45. He died on May 16, 1955 (while in a taxi cab en route to a doctor's appointment)—coincidentally two days before the anniversary of his father's death. He was buried on a farm he owned at Hillsdale, NY. Screenshot from the trailer for the film The African Queen. His considerable, if erratic, career as a movie scriptwriter was curtailed by alcoholism, and his contribution to The Night of the Hunter (1955) remains unclear. What is certain, however, is that Agee is one of the credited screenwriters on two of the great films of the 1950s (the other being The African Queen (1955)). Reports that James Agee wrote an incoherent screenplay have been proved false by the 2004 discovery of his first draft. That document, although 293 pages in length and manifestly overwritten (as is common with first drafts), is scene for scene the film Charles Laughton directed. Likewise, false are the reports that Agee was fired. Laughton, however, was nervous about the behemoth text in his hands with only five weeks to go before the start of principal photography. He calmly renewed Agee's contract and directed him to cut it in half. Agee complied. In Laughton's stage work (Life of Galileo, Cain's Mutiny Court Martial, etc), the great actor demonstrated he was a script editor of genius—he could induce the most stubborn and prideful writer to cut, cut, cut. And so he did in Agee's case. Later, apparently at Robert Mitchum's request, Agee visited the set to settle a dispute between the star and Laughton. Letters & documents located in the archive of Agee's agent Paul Kohner bear this out—they were brought to light by Laughton biographer Simon Callow, whose BFI book about Night of the Hunter diligently sets this part of the record straight. The Agee first draft may eventually be published, but it has been read by scholars—most notably Prof. Jeffrey Couchman of Columbia University, who published his findings in an essay, "Credit Where Credit Is Due." To assert Agee's moral right to his screen credit in no way disputes Laughton's greatness as a director—clearly, he was as expert with writers as he was with actors—but Agee has been belittled and even slandered over the years, when his contribution to Night of the Hunter was of primary and enduring importance. During his lifetime, Agee enjoyed only modest public recognition, but since his death his literary reputation has grown enormously. In 1957 Agee's novel, A Death in the Family (which was based on the events surrounding his father's death), was published posthumously, and in 1958, won the Pulitzer Prize for fiction. Agee's reviews and screenplays have been collected in Agee on Film. His work on and off the screen delve deeply into human suffering, human desire, and the instinct or will to survive. His penetrating and insightful depiction of characters' inner lives is all the more remarkable given his own struggle with alcoholism. In addition, Let Us Now Praise Famous Men, ignored upon its original publication in 1941, has been placed among the greatest literary works of the twentieth Century by the New York School of Journalism and the New York Public Library. Samuel Barber has set sections of "Descriptions of Elysium" from Permit Me Voyage, including the song "Sure On This Shining Night"; in addition, he set to music prose from the traditionally-included "Knoxville" section of "A Death in the Family" in his work for soprano, entitled "Knoxville: Summer of 1915." ↑ James Agee (1909-1955): Chronology of his Life and Work Agee Films. Retrieved August 31, 2012. Seib, Kenneth. James Agee; Promise and Fulfillment. Pittsburgh: University of Pittsburgh Press, 1969.